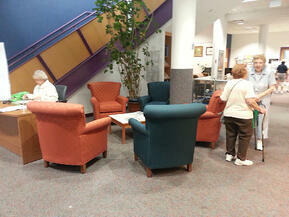 Furniture Solutions for People with Limited Mobility & Incontinence. Sen iors and others with limited mobility benefit from specialized seating for comfort, ease of use and safety. Facilities that specialize in the care of limited mobility clients and patients tend to pattern seating in common areas like that of a residence – clustered to encourage socialization, allow easy TV viewing, or to make group activities easier. While furniture arrangement may mirror residential, the furniture itself requires special considerations. Contract furniture sellers offer specialized seating pieces designed to offer maximum benefit to anyone with limited mobility and or incontinence. Arms. Arms on chairs are a necessity for those with limited mobility as they provide extra support for transitioning from sitting to standing and vice versa. Seat Height. Seniors and others with limited mobility often suffer from reduced muscle tone. In these cases, seat height must be higher to enable the extension of the knee from the sitting to standing position. Seat Height should range from 20” to 22”. Seat Depth. A shorter seat depth also aids in the transition from sitting to standing. Seat depth should range from 20” to 22”. Cushion Firmness. All seating pieces intended for use by individuals with limited mobility should have a cushion since the person tends to stay seated for extended periods of time. A cushion should not be so soft that it creates an obstacle for standing but should not be so hard that it is uncomfortable for extended use. Other Considerations. 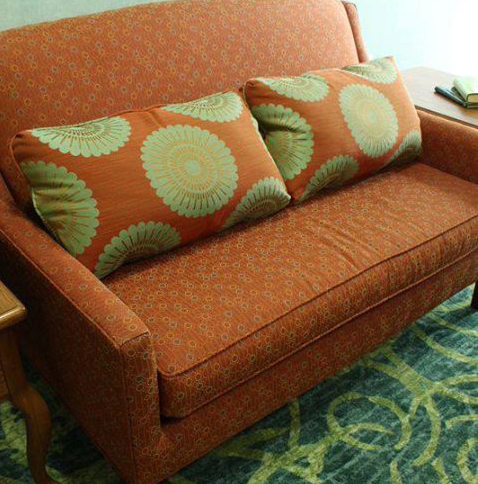 Fabric and other design enhancements can add to the comfort and function of seating for those with limited mobility. Limited mobility and incontinence tend to go hand in hand. Fabrics such as Crypton© offer a high-degree of fluid-resistance and can protect upholstered furniture from odor and staining. In addition, pop-out and clean out seat designs encourage fluids away from the client and the furniture. Caregivers and staff can easily access fluid clean-ups which are forced to the floor. Bariatric Seating: Bariatric furniture includes a wide variety of wood, metal and upholstered seating pieces that are designed and tested to hold up to heavier weights then standard furniture pieces. Wider seats. Extra heavy duty construction. Stronger Frames. Beyond common area seating, dining seating also requires specialized functionality and design. Dining chairs should have upholstered seats for comfort. Just as with living room seating, shorter seat height and depth is effective for dining chairs. In addition, dining chairs with casters on the rear legs only can add stability for transitioning from sitting to standing while allowing clients and patients additional freedom while seated. Pulling up to the table becomes substantially easier when the rear legs have casters.